At last beautiful autumn is around here. I guess it is time we have an autumn Ikebana class soon! 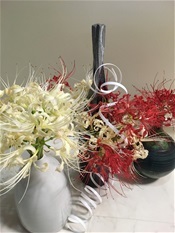 These flowers are called Higan-bana （彼岸花）and it means 'flowers of the Autumnal Equinox'. If you see the mountains or rice fields at this season, you will notice their beautiful red trimming of mountain slopes or country street sides. Enjoy!